Guidable Jobs is a platform that supports foreigners living in Japan who are looking for jobs. You can find information about job opportunities in Japan through our “Q&A” and “Job Search” services. Go to our main website in order to check our all the job options available! Here’s the link to the website: https://jobs.guidable.co/. Also, check out our new service “Guidable Crew”: https://crew.guidable.co/. Guidable Crew provides Freelance Jobs that fit your schedule and skills! We will provide free insurance for all new subscribers. The insurance will be applied when you are hurt in an accident at work. Insurance will be paid up to a maximum amount of 500,000 yen. One month from your registration to Guidable Jobs. 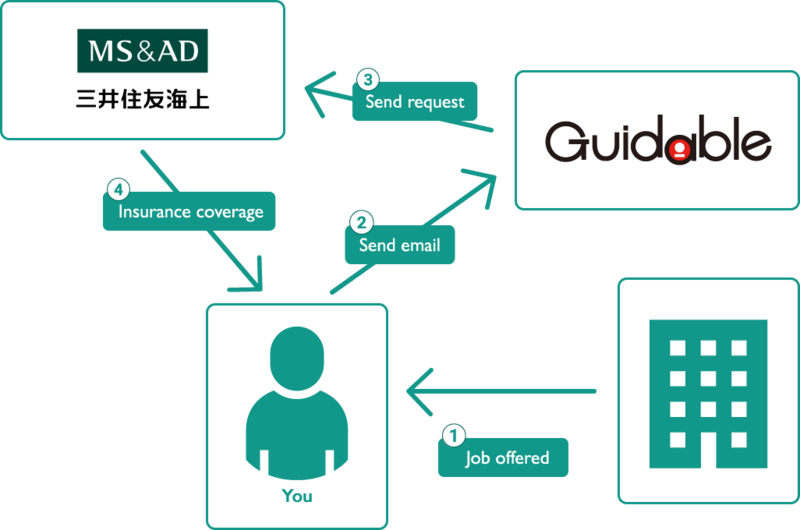 Register for Guidable Jobs and send an email to insurance@guidable.co.jp after you receive a job offer from Guidable. You will be covered for one month starting from your first work day. This insurance is available one time for one person. The content of this offer may be cancelled without any notification. The insurance is invalid if you forget to send an email. Our (Guidable Inc.) mission is “Remove borders between foreigners and Japanese” . And we own three types of websites “Guidable Crew”, “Guidable Jobs” and “Guidable Japan”. Guidable Crew allows foreign residents of Japan to get in contact with companies that are looking to hire foreign individuals with distinctive skills. Guidable Jobs allows foreign residents of Japan to get in contact with companies that are looking to hire foreign individuals with distinctive skills. Guidable Japan is a platform that offers guidance to Non-Japanese people who want to visit or are living in Japan. Copyright © Guidable All Rights Reserved.